The snow has been piling up here this week. The Girls were so excited to have enough snow to build fun snowmen with! They received this super fun snowman kit for Christmas which came with funny wooden pieces to create colorful and unique snowfriends. As you can see, they had great fun with it. Now, I am disappointed to share that the cold has been far too much for me this year. going from California to New York has created a lot of sickness and asthma issues for this mama, so daddy was the playtime hero this day, leaving alone time for me to play with pretty paper! 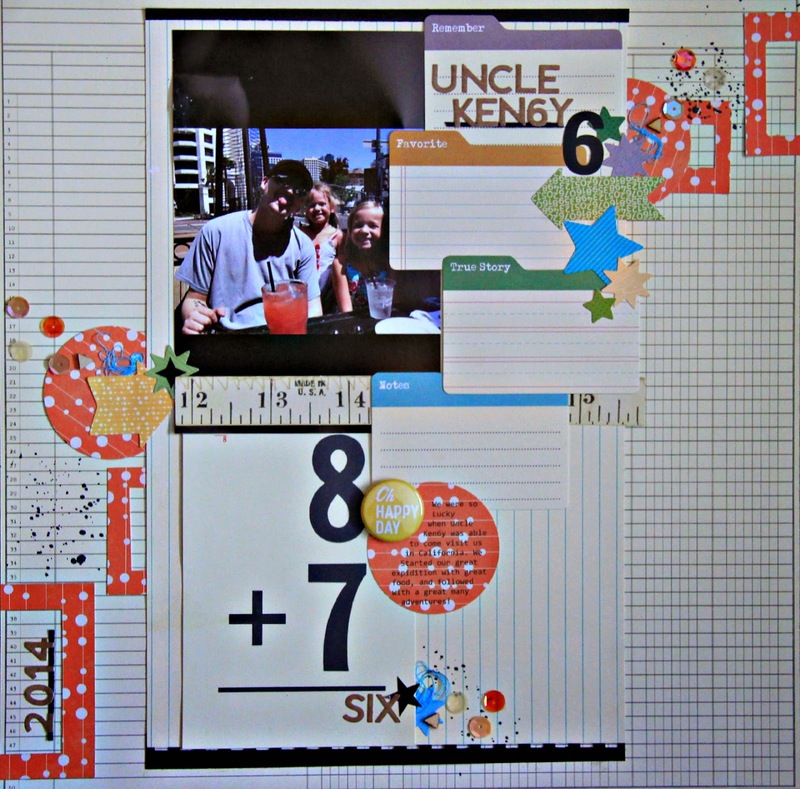 I created this fun new layout using this weeks sketch reveal over at Scrapbook Challenges. How awesome is this sketch! It leaves soo much room for personal style! I chose to slim the sketch down within a full 12x12 layout, adding scattered bits around the perimeter . Now I know what you are thinking, "this lady doesn't know how to add her numbers! ", but there is a silly backstory that can hardly be explained to its full awesomeness, but long story short; this is the documenting of our dear uncle Ken6y. As you can see, this silly uncle has a personal joke which adds a #6 to his name. It has been a life long childhood joke that we have all had from many years ago...this man is known as 6. The greatest and most uniquely fun uncle in the world! I had so much fun building off of the sketch which I used as my middle base. I used some Jillibean Soup tabs and stacked them atop one another as my title base. I love the neutral colors that can be mixed perfectly with some pops of bright tones, like the orange paper I used! I was happy to be able to finally document this sweet photo of one of our favorite people. I hope ya'll are staying warm and not too saddened by the next 6 weeks of winter, ( insert big sigh!) Thanks for popping in and seeing what I created from the "warmth" of my scrappy space! look at all that fun snow!!!! super fun page and love all the layers down the center!!! esp those tab cards!! Love love love this! LOVING the colors, the file cards and the circles!!! And loving the snow pics too!!!!!!!! I'm so sorry for the sickies you're having, girl! i feel you.. I don't do well in cold too! *hugs* Love the layout and the funny story that goes with it!! so much eye candy! love the layout!